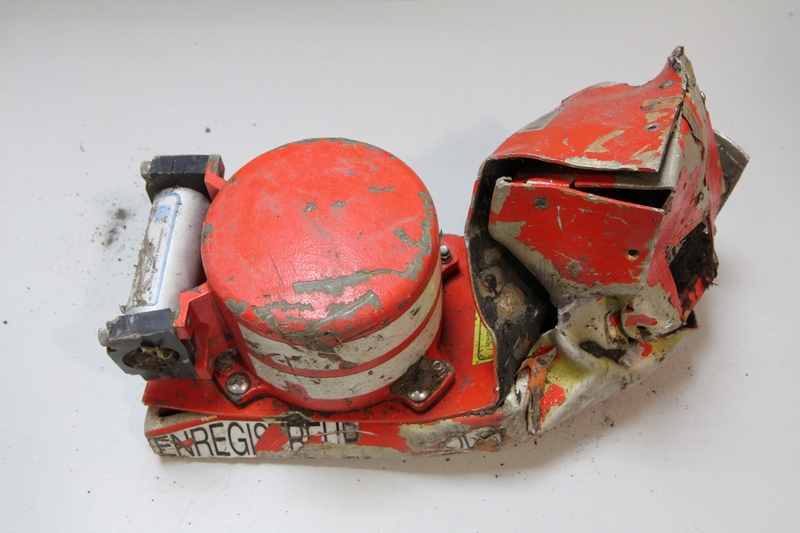 Investigators Examine Mangled Voice Recorder From Doomed Flight : The Two-Way A top French investigator said they hope to have "rough ideas in a matter of days" as to why Germanwings Flight 4U 9525 crashed in the French Alps Tuesday, killing all 150 people onboard. This photo from the French air accident investigation agency shows the voice data recorder of the Germanwings jetliner that crashed Tuesday in the French Alps. This post was last updated at 1:51 p.m.
French investigators say they are examining the cockpit voice recorder of Germanwings Flight 4U 9525, which crashed in the French Alps on Tuesday, killing all 150 people onboard. Remi Jouti, head of France's bureau of investigations and analysis, said at a news conference that the orange voice recorder was found mangled, but viable. "We have not yet fully understood and worked on it to be able to say, 'OK, this is starting at this precise point in flight. This is ending in precise point in flight. And we hear such person saying that, etc.' This is an ongoing work, for which we ... hope to have first, rough ideas in a matter of days," he said. The flight data recorder has yet to be retrieved, but French President Francois Hollande said its case had been found. The voice recorder and data recorder — the so-called black boxes — offer investigators the best clues to determine what caused the budget airline to crash en route to Duesseldorf, Germany, from Barcelona, Spain. Sabotage has been ruled unlikely by officials, though they are quick to emphasize that nothing has been ruled out. Here are some other developments we know Wednesday about the jetliner. -- The families of the victims gathered near the crash site in France for a ceremony, which was attended by German Chancellor Angel Merkel, Hollande and Spanish Prime Minister Mariano Rajoy. "Dear Angela, dear Mariano, rest assured ... we will find out everything," Hollande said. "France stands by you." Merkel said: "This is a true tragedy, and the visit here has shown us that." -- Germanwings CEO Thomas Winkelmann said the 150 victims were from at least 15 countries around the world, including two from the United States. State Department spokeswoman Jen Psaki said there were three Americans on the flight. She confirmed that two of them were Yvonne Selke and her daughter, Emily Selke, of Nokesville, Va. Psaki did not name the third passenger. Winkelmann said the victims included 72 Germans, 35 Spaniards, two each from Australia, Argentina, Iran, Venezuela and the United States, and one each from Britain, the Netherlands, Colombia, Mexico, Japan, Denmark, Belgium, and Israel. He said some of the victims had dual nationalities and that made establishing their nationalities difficult. The numbers are likely to change. Spanish Interior Minister Francisco Martinez said 49 Spaniards were aboard the flight. British Foreign Secretary Philip Hammond at least three Britons were aboard. -- Segolene Royale, France's energy minister, said the key to the investigation was what happened in the two-minute span that began at 10:30 a.m. local time Tuesday. That's when the plane began to descend after reaching cruising altitude. -- Ground crews made their way through new snow and rain to the scene to recover the bodies of the victims. -- Employees of Germanwings and Lufthansa, the low-cost carrier's parent company, observed a minute of silence at 10:53 a.m. Wednesday, Lufthansa said. That's when the contact with the flight was lost.